Nikkei is a Japanese-Peruvian fusion restaurant that’s been making a name in Manila. 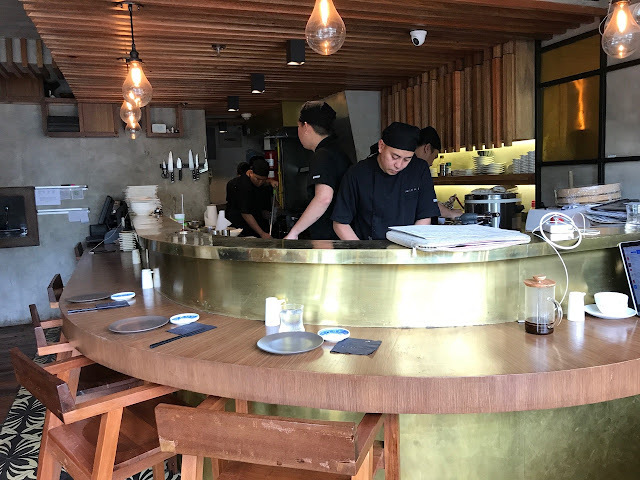 The restaurant’s initial plan was to serve Peruvian cuisine, but in order to meet the Filipinos’ fondness of Asian cuisines, what better way to intrigue the market than to offer a fusion of both familiar and new flavors? Currently having 3 branches, head chef Juan Barcos credits the restaurant’s success to using only the freshest products and delivering quality food consistently to customers. For our appetizer, we enjoyed a plate of pomelito tiradito. It’s a dish made of thinly sliced tuna topped with mango and pomelo slices, drizzled with garlic passionfruit fish broth, and sprinkled with sunflower seeds for an added texture. From a light starter, we moved on to a heavier appetizer with the tuna latke. 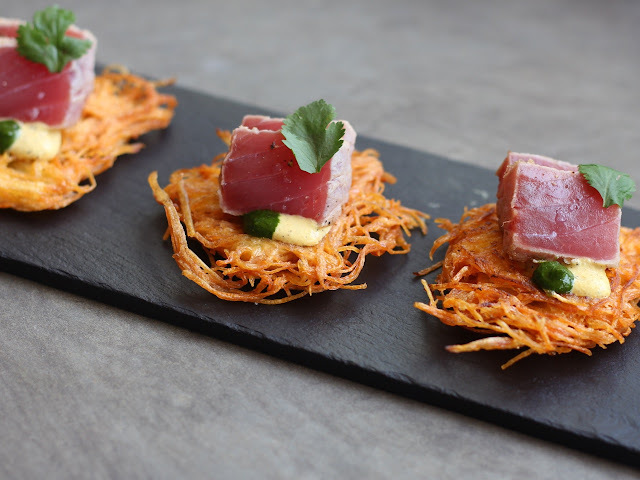 It’s one of my favourites (early on in this meal), with potato strings combined to make a pancake, topped with chunks of seared tuna and cilantro, and a nice touch of huancaina sauce in between. 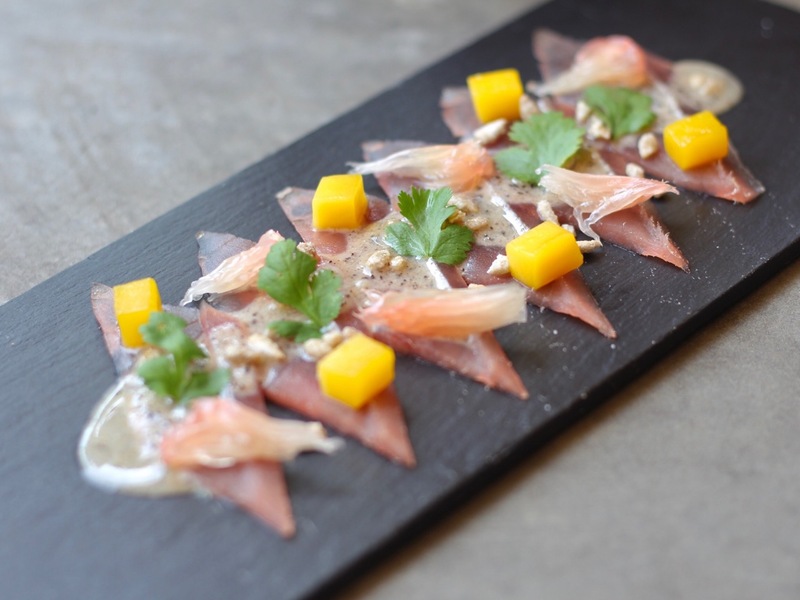 What made this dish so beautifully executed was the huancaina sauce that binds the two elements together, sort of like a complementing agent that pairs the two so perfectly. 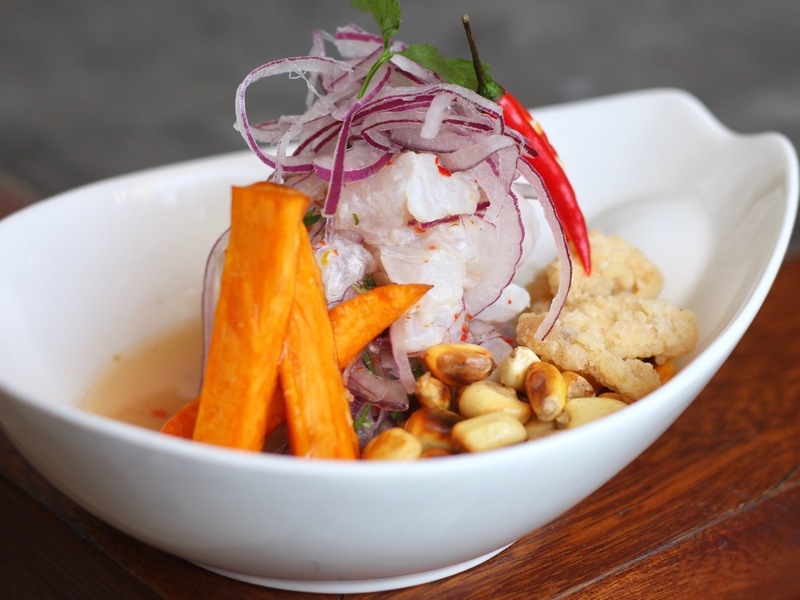 A Japanese-Peruvian experience won’t be complete without the ceviche. A bowl made of white fish chunks, red onions, rococo, cilantro, canchita, and glazed sweet potatoes, Nikkei’s classic ceviche was one of the best ceviches I’ve had. It had a lot of components, yes, but it did not turn out to be a dish that had overpowering, overwhelming flavors. I was really excited about the rolls. 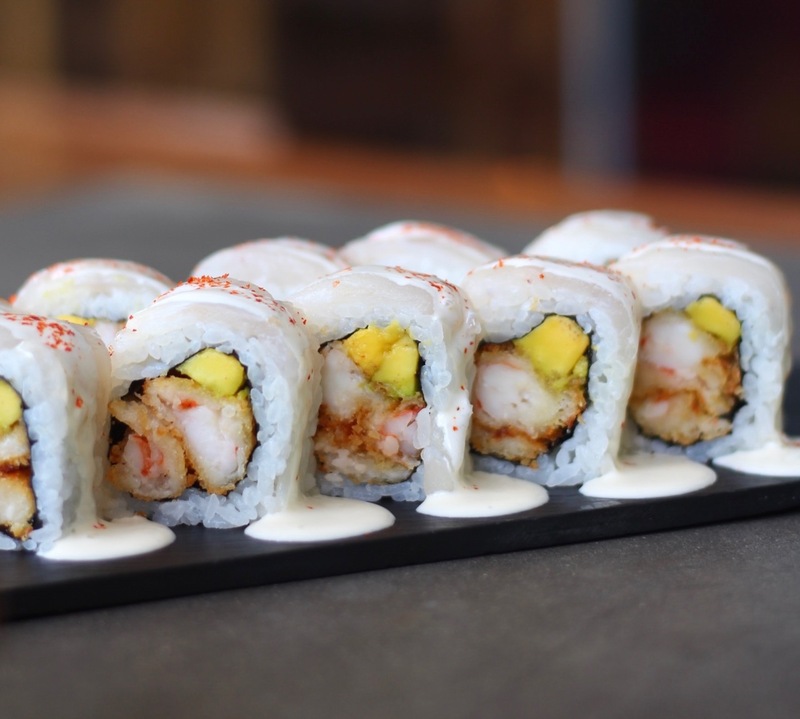 I've watched a lot of rolls being prepared in their kitchen prior to our late lunch, which made me think highly of it, and I wasn't disappointed. I loved how the thinly battered fried prawns still managed to add crunch to the rolls. It also had diced avocado, white fish, ceviche sauce and togarashi spices. Nikkei’s seabass katsu set is one of Nikkei’s newest items under their brunch sets. 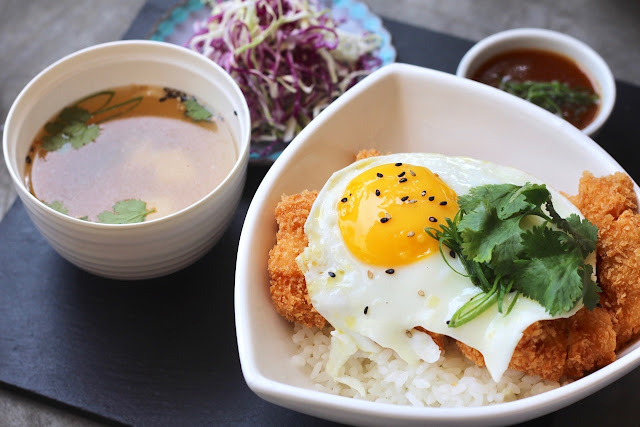 At first I thought it was our typical katsu with battered and fried seabass on top of gohan rice, served with fried egg, shredded cabbage, and miso soup. The difference comes with their sauce, which had acidity that I cannot really decide on whether or not it’s a better dip, but I liked it anyway just because it was different. 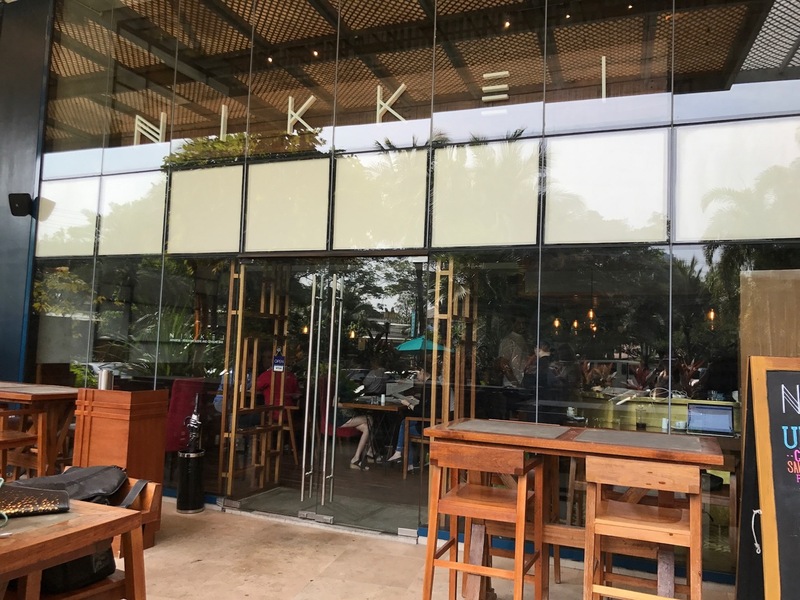 Another breakfast staple with a little twist is the Nikkei Benedict. 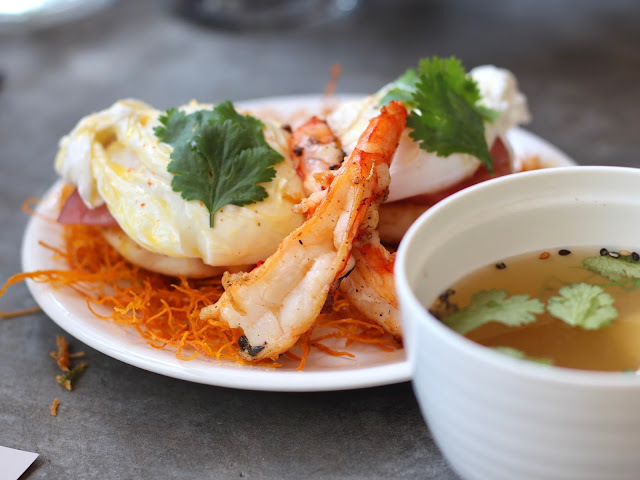 Poached egg, steamed bun, tuna, prawns, and hollandaise sauce on a bed of crunchy potato strings are just the right components to make that brunch date even more special. 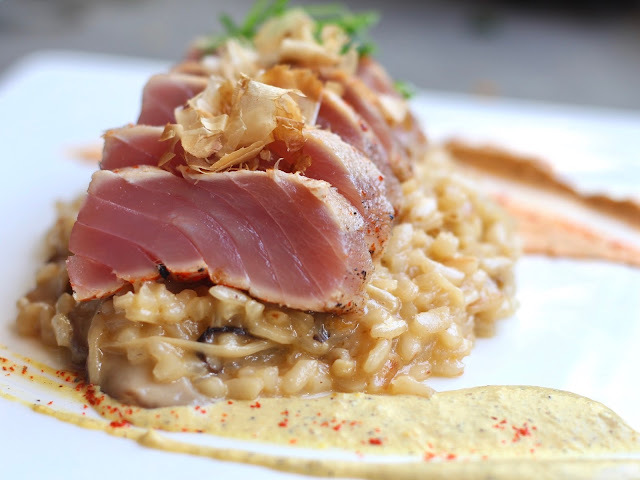 If you're looking for a heavier meal, the seared tune with sea urchin risotto is a highly recommended choice. It's a dish made of uni with enoki and shiitake mushroom risotto topped with tuna steak sprinkled with togarashi and katsuobushi. A delicious and healthier dessert that surprised the whole group was Nikkei's picarones. 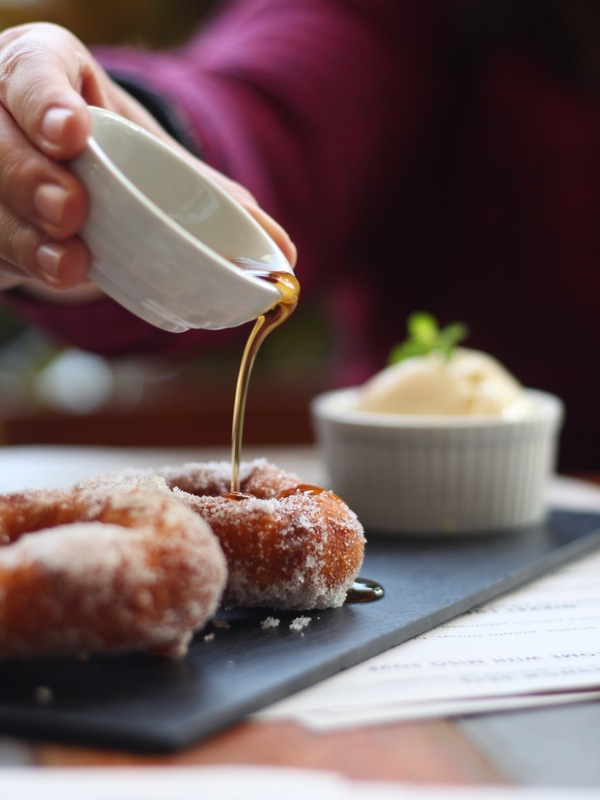 With dough made of sweet potatoes, this donut's texture was a bit different, but combined with the cinnamon sugar coating, maple syrup and the ice cream, this dessert sure was the best way to end the meal. 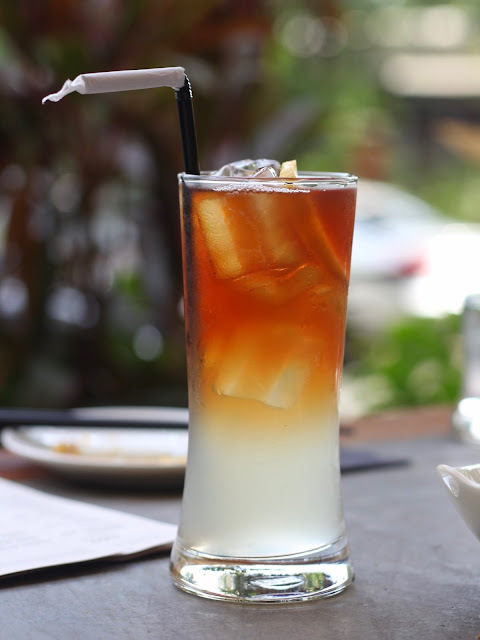 Fresh squeezed lemonade layered with organic passion berry black iced tea. 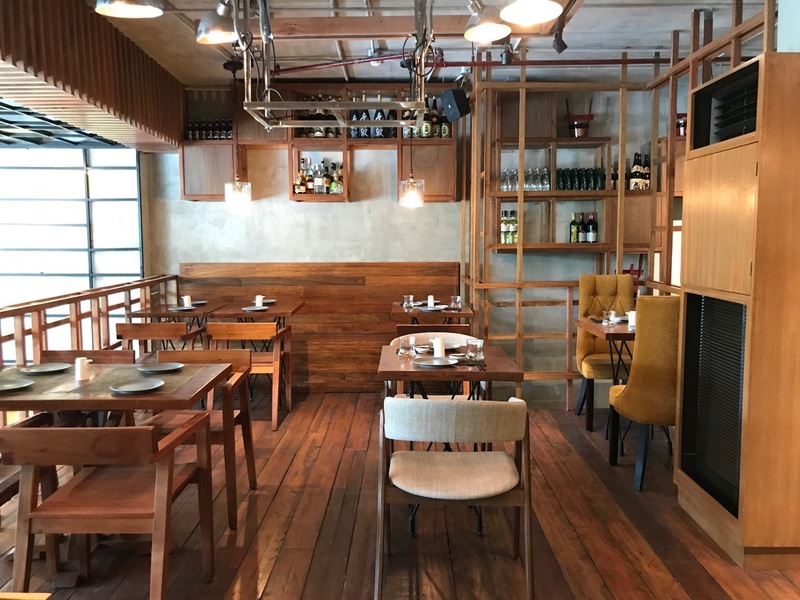 The restaurant's design is also pretty neat, very urban and minimalist filled with wooden furnitures. They also have private rooms for those who are planning to dine as a group, or planning to have a small business meeting.